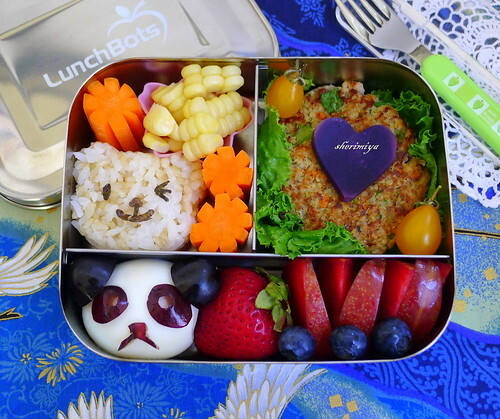 Panda Egg Salmon Patty Bear Onigiri Lunchbots Bento, a photo by sherimiya ♥ on Flickr. Today I packed a couple of salmon patties for TinySprite in the Lunchbots Trio box. Like with the bean burgers, I bulked them up with extras; this time I used brown/white rice and quinoa. I also added shredded carrot, and minced onion and celery. It's good with Dijon mustard and a little yogurt or sour cream, and a squirt of lemon juice. Just mix until the consistency holds together, then flatten some balls and pan-fry. You can serve with mustard Old Bay aioli on a bun, but I've just placed her patties in some lettuce leaves. There's a little bear onigiri, some carrots sticks, corn off the cob, a panda egg (I cut the ears, eyes and mouth from grapes by hand), and assorted fruit (strawberry, pluot and blueberries. The kids are really digging the burger variations. What else can I make a burger out of? Hmmm. Oh my gosh, I love this one! My frig is so barren right now, I'm jealous of all your colorful fruits and vegetables. The patties you make always look so good. The last 'new to me' patty I made was one of Izumi's (Soul Soup Soap) ground chicken and tofu patties. Sometimes chicken or turkey patties can get really dry, but the crumbled tofu kept them really moist. Your bento looks so good today; I'm so impressed by how much you can do with a "barren frig"! I vote for turkey burgers again. ;) Love all the burger variations you've been doing lately. If they like bean burgers, what about lentils? I know you often pack lentil curry, correct? I made lentil cakes once and really enjoyed them. Yes, I've made lentil curry before, but never lentil burgers. Great idea! Ohayo Bento: If you're a fan of barbque sauce, try adding some to the ground chicken or turkey and it will keep them so moist! yumm! @Sheri: Do you send this with your kids cold or do you prepare at home, warm and take to them during lunch time? This kind of bento I prepare at home cold or room temp, and they take it to school like this. If they take it like this, it can warm up to room temp by lunchtime and they like to eat at that temp. For warm foods, I'll pack in a thermal jar so it will be warm when they eat.